Lots of worship music is lame, but it doesn’t have to be. Lots of modern worship music is bad. Bad lyrics, bad music, bad theology. But that’s not my point. My point is it doesn’t have to be bad. There are excellent, deep, beautiful, honest, spiritually rich worship songs being written today. I wish to offer two examples and an observation. This is simple without being shallow, light without being vapid, celebratory without making us sound like cheerleaders. “Adopted.” We get lots of “child of God” in modern worship, which is great, but not much about adoption, which is how we become children of God. When we decided to include “Hidden Place” on the album, I was a little concerned about the one-sidedness of this story. By including a song about having a baby, you touch a nerve of many women who are not able to have a baby, or couples who have lost a baby, and all manner of grief of this kind… And since honest joy and honest grief are both recorded in the prayers of God’s people throughout church history, I wanted to give a fresh voice to both on this album. The harmonies on that song are also exquisite. I’m a pretty quick study when it comes to learning songs, and I had to walk around listening to it for about 3 days to get them right. Again: Truth, non-trite encouragement, musical excellence. This can be done. Observation: I know from Sandra’s history with Indelible Grace that she has spent years absorbing great hymns. I don’t know what Aaron listens to, but I know he reads lots of Scripture– his songs are thick with it. Same for Sandra. In both cases, the quality of their influences shows through quite nicely. So here’s the point: Feed on good things, and your output will be good. If you want to write songs that help us worship Jesus, thank you. Please soak yourself in Scripture, in the words of faithful saints throughout church history, in things that are beautiful and lovely and true and real. We can tell the difference when you do. I have a favorite song about God. I have a favorite song about Melissa. I have a favorite song about Sam, and one about Foard. I have a favorite song about Prague, and about moving to Prague. I have a favorite song about the church. I have favorite instrumental songs, and favorite vocal songs, and favorite piano songs, and favorite guitar songs, and songs that just make me laugh because of how ridiculously good they are, and songs that have been my friends for 10 years or more. But favorite song? Couldn’t tell you. Prague offers lots of personal time. I appreciate this. Specifically it offers a lot of time in transit– walking, on the tram, on the metro, on the bus. Which means there’s lots of time for the iPod, if you’re into that sort of thing. And I am. I have been amazed how life-giving it is to listen to music going from point A to point B. More than having it on in the background– I mean having the earphones in, not doing anything else but walking, listening hard, hearing things you never heard before. I get so lost in it I’m sure I look like an idiot. I wondered why this was such a big deal, why it lifts my mood so much. Then it occurred to me: Music is home. Home’s a complicated word for us right now. A heavy word, even. But when His Band And The Street Choir comes on, I’m home: on the back porch at Cross Creek in Athens. When I hear Live at the Georgia Theatre , I’m driving back home to Charlotte after seeing that show with Taylor. When Ray LaMontagne sings “Let It Be Me ,” I’m holding Foard, at 2 weeks old, in the middle of the night at our house in Plaza Midwood. And of course there’s the Black Crowes and the Wood Brothers . Friends old and new. Is this an escape? Sure. It’s not our real home– but then neither is Prague, or Charlotte, or Athens. And this pilgrim is thankful for whatever I can get. Are you praying to become more like Jesus in 2011? Good. Me too. But don’t be surprised if it happens like this. May God set us free from self and pride this year, even if he must break our schemes of earthly joy in the process. “The Gods Are Not Angry”… only sometimes he is. 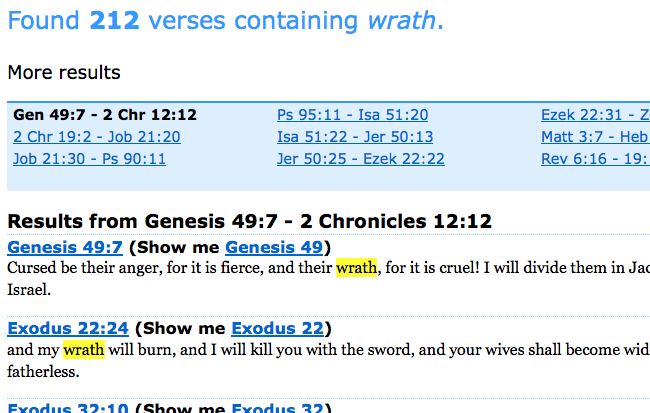 Search for “wrath” in the English Bible and you’ll get something like this. Search for “wrath” as a theme in popular contemporary worship songs and you’ll get something like this. Man, created in God’s image, is capable of incredible heights of creativity… and depths of depravity. The Wood Brothers, who you may never have heard of, have been my favorite band for over a year now. Chris Wood, who plays bass for the jazz trio Medeski Martin & Wood, joins up with his brother Oliver, guitar player for the Atlanta blues band King Johnson. With Chris on standup bass and Oliver on guitar, they bring a unique vibe that I’ve described as what Van Morrison might have sounded like if he grew up in Mississippi. These guys are two of the tastiest players I’ve heard– every note is exactly what belongs in its place. The simplicity of the instrumentation, the perfect blend of the brothers’ voices, the weighty ease of the lyrics– everything combines to make you just close your eyes and smile. If you’re looking for something new, and especially if you’re in a music rut, pour a glass of wine and check these guys out. They’ll bring some color to your world.